Seamus Sands was brought up in Co. Down and now lives in Co. Cork, Ireland. He is very highly regarded for his unique personal style of relaxed, melodic, and rhythmic traditional Irish fiddle playing and was taught and influenced by some of the legendary players no longer with us. He comes from a very musical family and a long line of fiddle players. 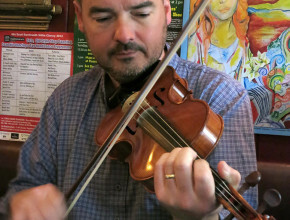 Seamus has recorded two fiddle albums and featured on several other albums. His latest album is “A Deep Pool“. Seamus has developed a unique and appealing style of fiddle playing, having absorbed various aspects of the musical textures of both the North and South of Ireland, and his style is grounded in strong family roots and a deep appreciation of older musicians and of older music sources. He has a particular interest in bringing long-forgotten tunes and versions from his family home area to life.